This tea brings a feel-good factor to your stomach at any time of the day. A harmonious blend of vanilla and cinnamon, it presents itself in a warm amber colour. Accompanies quinoa, vegetable casseroles and light salads like a true gentleman. Superb! 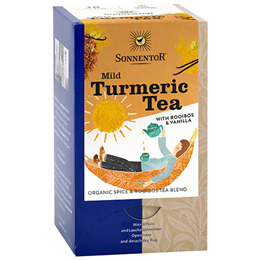 From organic farming: turmeric 48%, Rooibos 19%, Ceylon cinnamon, cardamom, ginger, licorice, black pepper, vanilla 1%. Below are reviews of Sonnentor Organic Mild Turmeric Tea - 18 Teabags by bodykind customers. If you have tried this product we'd love to hear what you think so please leave a review.